The Ducks were be back on the field Tuesday for the first time since their humbling loss in the National Championship Game on January 12th. Following that loss, many writers proclaimed Oregon’s chances at a future national title in the future dead, or at least significantly diminished. And those were just the responses that came after the game, which doesn’t even include the speculation of said window closing before the championship game was even played. Joey Harrington, Dennis Dixon, Marcus Mariota all finished in the top five of Heisman Trophy voting. 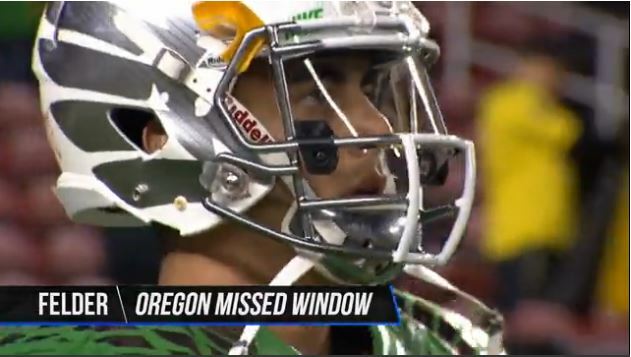 The player whose on-field absence was most visible on Tuesday is the same one whose departure has fueled most of the assumption that Oregon’s window has closed: Marcus Mariota. While Mariota was a once-in-a-generation star, the prevailing mindset has become that his mere absence will precipitate Oregon’s freefall from national relevance. While there is no doubting Mariota’s place in the team’s history — any question about his status as the greatest player ever to play for Oregon ends by pointing to his Heisman Trophy — he is far from the only great quarterback to play for the Ducks. Of Oregon’s four top-five Heisman finishers, three were at quarterback, all since 2001. Three Ducks have been top-three NFL draft picks over the last 17 years, including two quarterbacks; Mariota could be the fourth and third, respectively. And that just describes what the Ducks has done with marquee talent; in 2008 they won ten games using their fifth-string quarterback. The Ducks hasn’t won fewer than ten games in a season since. Now that the Ducks find themselves facing a season of transition, how does Oregon fill the greatest void in team history? They start by landing the nation’s most high profile transfer, Vernon Adams, a graduate transfer quarterback from Eastern Washington, who chose Oregon despite overtures from his hometown program (UCLA) and the second-winningest team (Texas) in college football history. That is a solid option in Oregon’s desire to reload instead of rebuild. The future is looking up for coach Mark Helfrich. During the 2014 offseason, questioning Helfrich’s coaching acumen had some traction, but by this offseason, those concerns have been silenced for all but his most ardent critics. Not only has he matched every one of Chip Kelly’s achievements at Oregon, he did so in a season with a roster depleted by injuries, an issue which only caught up with the Ducks in the season’s final game. Those with lingering questions about Helfrich will point to Oregon’s performance in the title game against Ohio State while ignoring the wins the Ducks strung together to get there, most notably their blowout of the defending national champions in the Rose Bowl,ending their 29-game win streak eleven days prior to the championship game. Urban Meyer may have gotten the best of Helfrich in their matchup in January, but Meyer has done the same to national championship-winning coaches like Jim Tressel, Bob Stoops, and Nick Saban (twice), who likewise found themselves on the wrong end of a score in a postseason game against Meyer. The opinions on Helfrich may vary, but his resume is impressive: His career winning percentage at the FBS level is the best of any current FBS coach. He’s the second youngest coach ever to lead his team to a National Championship Game (Only Bob Stoops at 40 was younger. ), and he’s eight years younger than any other current coach at the FBS level to have achieved that mark. 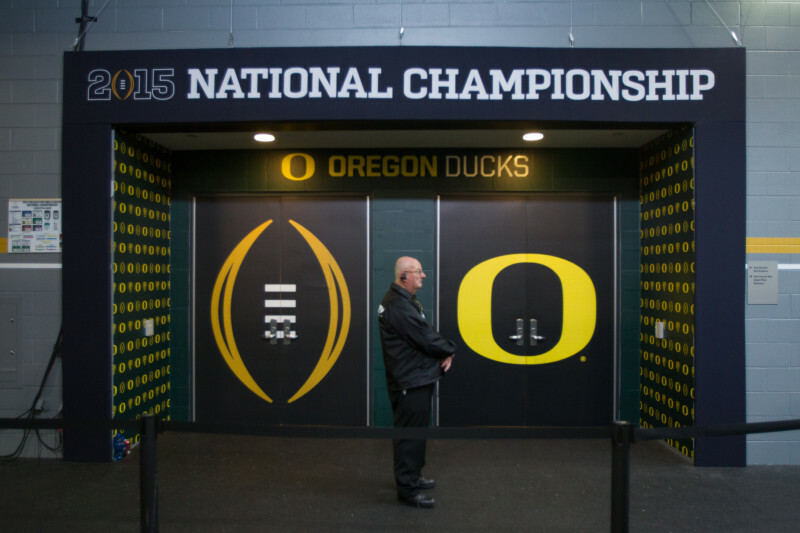 Some have speculated whether Oregon’s title window has closed, but what about its doors? It’s the story written about Oregon every offseason. Following Oregon’s first title appearance in 2010, many speculated that Oregon was an interloper who had missed its shot. In 2011, a late season loss to USC triggered speculation that the Trojans’ pending ascent spelled the end of Oregon’s run. Chip Kelly left the Ducks following the 2012 season, a move certain to spell Oregon’s downfall. Hiccups during 2013 season only intensified the “closed window” argument, which peaked in its believability by the start of the 2014 season. Yet in 2014, instead of being the beginning of the end, the Ducks ran off one of the greatest years in school history. 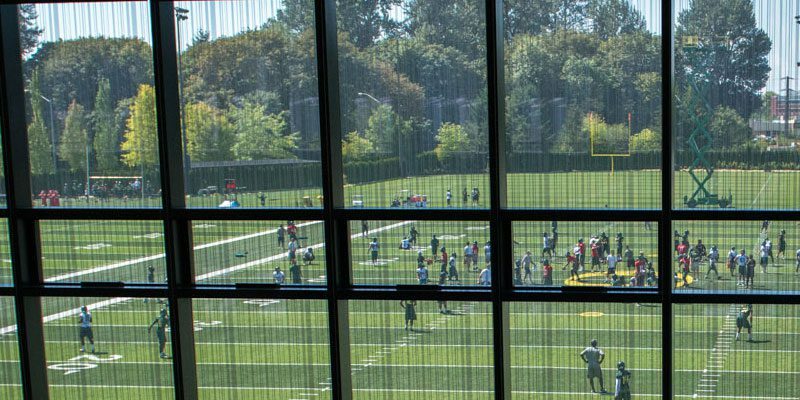 The “closed window” argument is one that will be made every year until Oregon wins a title, and possibly even after that. 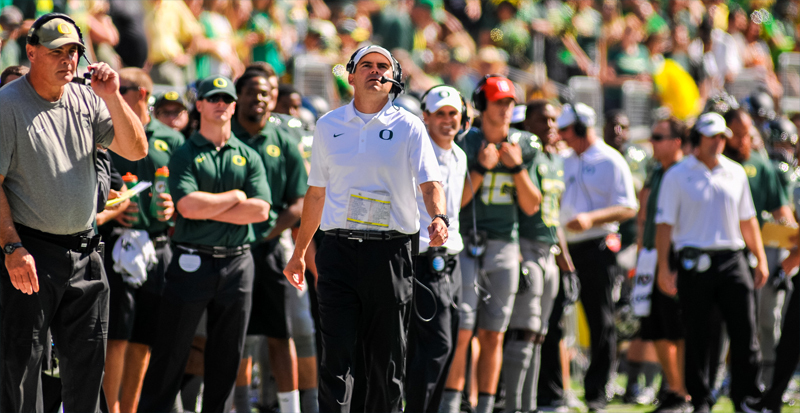 It is understandable why Oregon’s presence as a national contender is viewed an outlier against the landscape of college football: Programs don’t just join national relevance at that level. The Ducks first became ranked number one only five years ago, the first program in two decades to achieve a first-time top ranking, and programs without tradition don’t have a history of sustainability in college football. Because everything that has come before tells us that Oregon’s run should have ended by now, it’s tempting to predict its end at any moment. But until there’s evidence that Oregon will fall off beyond “it hasn’t been done before”, expect the Ducks to contend again until further notice. Top image by Steve Francis.